Efficient generation and delivery of power is a critical component of contemporary urban infrastructure, and was a prime driver in EnergyAustralia’s brief for replacement of the City North 33/11kV zone substation in order to meet electrical load requirements for the City of Sydney’s future growth. 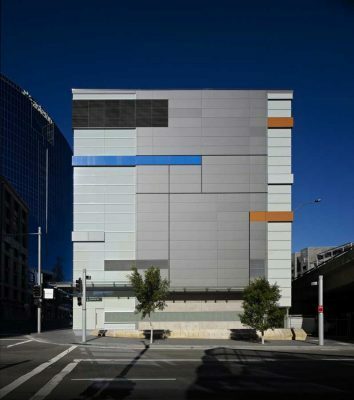 The project was the subject of a design excellence competition to achieve a result that would respond to the site’s context, provide for a durable and low maintenance development, and improve the urban domain of this precinct of Sydney with effective communication of the substation’s operation building on a tradition of quality design for electrical infrastructure. There were also very specific spatial and layout requirements to accommodate the electrical equipment and ensure safe and reliable operation for a zone substation, and a key objective was the achievement of an optimum environment for equipment operation and staff functions with minimum energy consumption. Passive design principles were to be adopted wherever possible and this required the use of natural ventilation with louvres and vents in strategic locations. Security and access provisions were also critical elements in the design resolution. On this highly visible site in the public domain of Darling Harbour and the periphery of the Western Distributor there was an opportunity for a contemporary and enduring design that could interpret the building’s function with references to the sources and impact of energy supply while complementing the urban context. A further opportunity was the potential for an outdoor gallery that could activate the pedestrian environment at ground level and contribute to the cultural layers of the city in this precinct. With the substation envelope presenting a considerable bulk and visible presence in this location, it was considered necessary to break down the façade with a hierarchy of forms, materials, layers and details that would be both robust and appropriate in this context, while providing a suitable palette for the intended design concept. Utilising a façade modulation and matrix configured around the functional elements of the substation, a ‘Mondrian’ inspired abstract aesthetic was the source of an architectural expression for a dynamic and flexible design envelope that could be site responsive, portray a sense of the building’s function and convey an impression of the transformation of energy within and the transmission of power beyond. This façade system also provided a rationale for future commercial development on the existing substation site to the south, and references to the materials, details and varying scales of buildings surrounding the site. In the CNS project, the Mondrian aesthetic has been employed to express the idea of an energy source continually transmitting outwards through a distribution grid. The coloured and illuminated glass panels integrated into the building’s gridded façade create a subtle representation of an ‘energy pulse’, provide an abstract reference to the transmission of energy to the Sydney grid implying the electric current flowing into and out of the CNS. The design seeks to maintain the client’s corporate objective of ensuring that the substation does not seek or compete for attention in its urban setting, but is however consistent with the intention to provide a substation expressive of its function on a prime CBD site. The outcome is both contemporary and enduring in providing a visual transition between the varying forms, scales and colours of the surrounding CBD, residential and entertainment zones. On both street frontages provision has been made for display of static and digital art. Grid Gallery has recently opened as part of Sydney’s VIVID festival and is Sydney’s first public and media-based gallery space dedicated solely to the exhibition of digital art. This project is unique because there is both a physical and virtual exhibition space. This website is a key component, allowing visitors to view the online gallery and artists to submit work.